San luis Hotel Galveston is the most prominent hotel along the Galveston beach. It looks very much like a Caribbean resort. 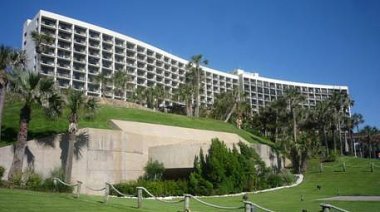 The family friendly hotel overlooks the sea from a hill along the seawall. It is easy for parents to watch their kids on the beach from the hotel. San Luis is a well kept hotel with clean cut lawns, beautiful palm trees and illuminated waterfall. It is among the most expensive hotels on the island and a frequent host to many events and conferences. It's a nice place to stay with the right money. However if one is on a budget plan, then consider the less costly but excellent hotels. All balconies are in the pathway of the strong breeze from the Gulf of Mexico. The hotel is a pretty busy all year long. We were there in November and there were a lot of visitors. The rooms are very clean and spacious with good mattress, bedding and marble decorated bathrooms. The rate is higher at the top floors. There is a floor dedicated to adults only. The hotel has a small but efficient work out facility. A very helpful staff is ready to help at any time. I love the location of the swimming pool. It sits right on top of the hill in front of the San Luis Hotel Galveston. It gives a pretty good view of the sea and the Galveston seawall boulevard. 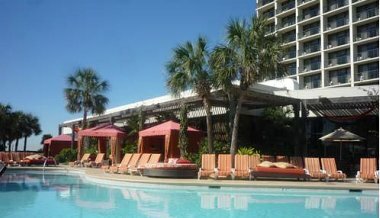 There are Cabanas and Daybeds along the pool side for rent. They are not very many and it is best to book them with the hotel room together. The hotel parking is free except for valet parking. The parking garage is behind the hotel. Just a reminder, there is no disable persons parking spot on the front side of the hotel. San Luis Hotel Galveston has a nice eating place alongside all the other nearby restaurants thriving along the seawall. The Landrys restaurant, I-Hop and the Rainforest Caferestaurant are just arround the corner. San Luis Resort Spa Conf Ctr, 5222 Seawall Blvd Galveston, TX 77551.